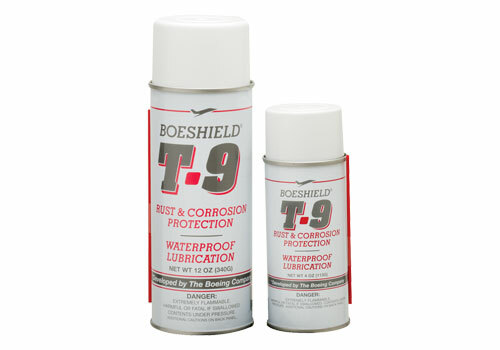 Improve the performance and function of your lathe and other workshop equipment with Boeshield T-9 Rust&Corrosion Protection waterproof lubrication, available from Craft Supplies USA. Simply spray T-9 on the bedways of your lathe and wipe off for a thin-film lubrication, which isn't oily or greasy. Developed by Boeing Aerospace, the product dries to a clean waxy film that won't collect wood dust and debris. The product lubricates lathe bedways for a smooth gliding tailstock and contains a deep penetrating paraffin wax, which is waterproof and not easily removed without solvents. T-9 is easy to apply: just spray on the lathe bedways and wipe off. Designed for penetration, moisture displacement, lubrication and protection and attacks existing rust and corrosion. Safe for use on paint, plastic and vinyl.